Ideally situated quiet escape, located on a stud farm on the river Alde & Suffolks Heritage Coast. 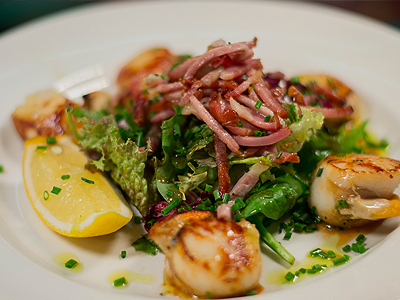 Close to Orford, Snape, Aldeburgh, Thorpeness & Walberswick. 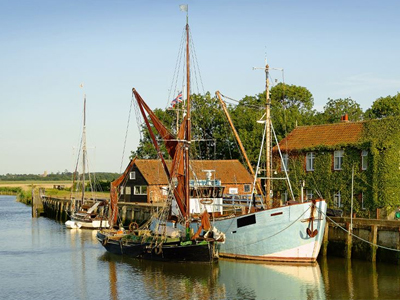 These cosy, high spec self-catering holiday cottages on the suffolk heritage coast near the sea, are in an exceptionally peaceful setting surrounded by the river Alde on three sides with close access to walking and beaches. The Farm is set in 80 acres of lush green horse and sheep grazed fields. With meandering freshwater marshes, frequented by Deer, Owls, Marsh Harriers, and a wide variety of other wildlife. The properties are powered by our 30Kw of solar panels. 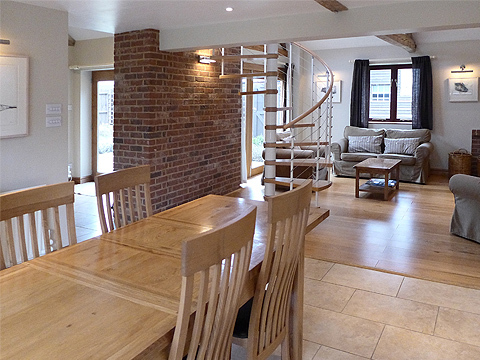 Open planned kitchen/dining/living space with oak floors, wood burner and vaulted ceilings. Luxury bathroom with bath with overhead antique shower and heated towel rail. Super king master bedroom and second bedroom (carpeted floors) which can be set either as a twin or large double on request. Electric heating and hotwater. - Large bath/overhead shower/underfloor heating. 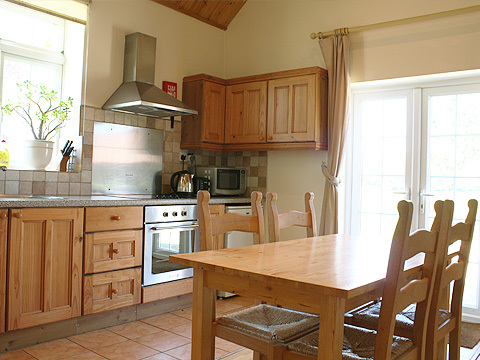 A larger property than Valley Farm Cottage, so better suited for longer stays & families and groups of 4 adults. The open planned living space is finished to a high standard with oak and tiled floors (carpeted bedrooms), beams and brick character features. Entrance hall with hangers and boot space. A woodburning stove for cosy winter nigths and private garden & patio with views across paddocks. - Main superking double bedroom. - 1 x room as three singles or 1 x Super kingsize & single. - Marble tiled bathroom: large bath, sink, toilet, heated towel rail. - WIFI, Freeview 48" TV/cinema sound, Netflix, Blueray DVD. - Oak kitchen with built in double fridge & dishwasher. - Large open planned living & kitchen. 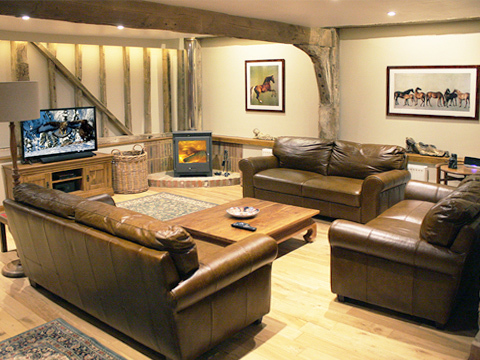 Our most spacious property, this lovely barn conversion has lots of room with its open planned living and dining/kitchen space. Beams and oak floors make this a great space for 2-5 guests in two bedrooms. One with a super king bed, the other has three single beds (for families with 2/3 children sharing) which can be set as a double and a single as required (eg. For stays with two adult couples). - 1 x room with 2 x twin beds and a bunk bed for two children. - 2 x bathrooms with large baths and overhead showers, washing machine/dryer. - WIFI, TV/cinema sound, Netflix, Blueray DVD. - Stone work top designer kitchen with built in double fridge & dishwasher, microwave, oven & hob. - Open planned living & kitchen. 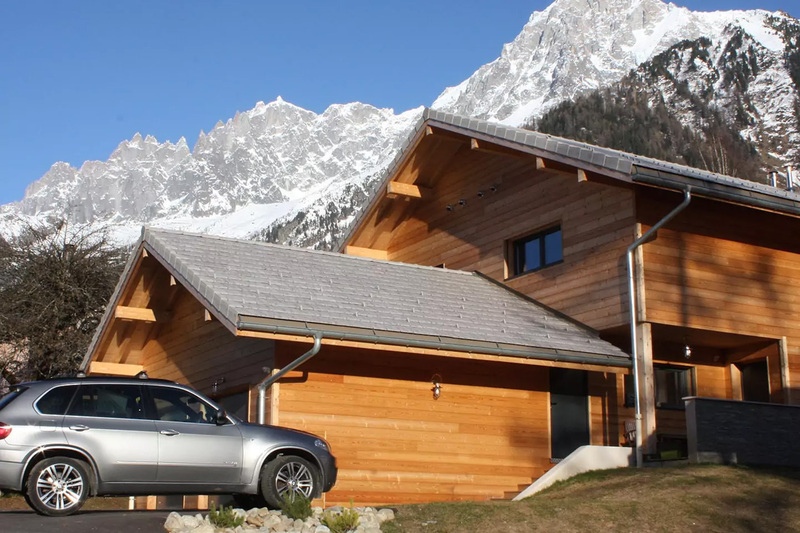 This modern high specification chalet 5 mins drive from Chamonix town at the foot of Mont Blanc. Luxury large baths & overhead showers, comfortable super kingsize beds, oak floors & a very high standard of fittings throughout. Ideal family accommodation. This modern chalet is built over 2 floors; With 3 bedrooms , 2 bathrooms, and a separate loo. This chalet has all mod cons, including cooker, hob, microwave, fridge/freezer, dishwasher, washing maching and dryer. The chalet has been furnished with a contemporary look that still retains a distinctly alpine feel to it that creates a feeling of warmth and comfort even during the coldest snaps in the heart of winter.